You gotta wonder what inspired the first guy to eat a pineapple what prompted him to try the pineapple in the first place. Because the outside of a pineapple is prickly and forbidding pretty much all over. But once you cut into a nice ripe pineapple and get that first whiff of sweet, tender pineapple deliciousness…I would like to find that guy and thank him. Or her. Because while canned pineapple is nice and convenient and all, I’m here to tell you that once you make that first slice, pineapples are very cooperative, and canned pineapple cannot hold a candle to fresh stuff. And…bonus points!…the pineapple shells make extremely fun boats to serve whatever you are serving. In this case, we will be making a super easy, super delicious sweet and sour shrimp. With, you know, pineapple! One pineapple will serve four people, because you are going to take your big trusty knife and slice it into quarters, right from the bottom all the way through the pointy leaves on the top. Once you have your pineapple quarters, take a paring knife and run it under the delicious pineapple center, getting as close to the outer shell as possible without cutting through it. The very center of the pineapple is going to be a tougher core – once you have the pineapple cut out of the shell you can trim that bit off and then cut the rest of the pineapple up into little bite-sized chunks. Now mix up a quick sauce of vinegar, soy sauce and ginger (the spicy part) and marmalade (the sweet part). If you are not a big marmalade fan, either peach or apricot preserves will work just as well. Now we are ready to make pineapple shrimp magic happen. Cook up some peeled shrimp and chopped scallions in a little butter for about 3 minutes. Add the pineapple and some snow peas and stir for another minute. Now add your sauce and stir for another minute until the sauce is warm and bubbly and coating everything. When all this is done, put each pineapple quarter shell on a plate and divide the shrimp mixture on top of the shells. Some is going to spill over the sides, which is wonderful because it practically shouts CORNUCOPIA OF SHRIMP AND PINEAPPLE DELICIOUSNESS AHEAD!! that way. 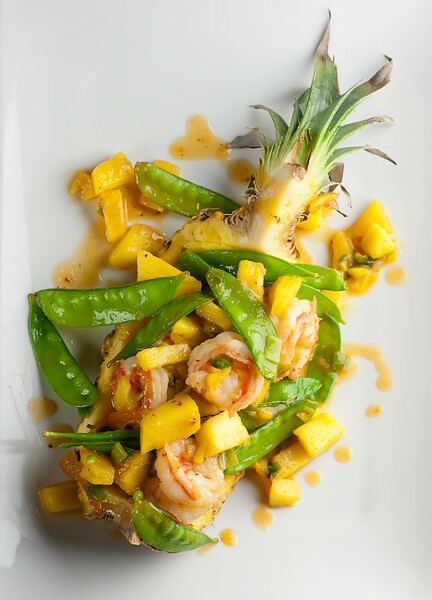 Drizzle on any leftover sauce, and prepare to be instantly transported to a tropical shrimp and pineapple vacation right at the dinner table. I highly recommend playing Jimmy Buffett while you eat, and possible having boat drinks. 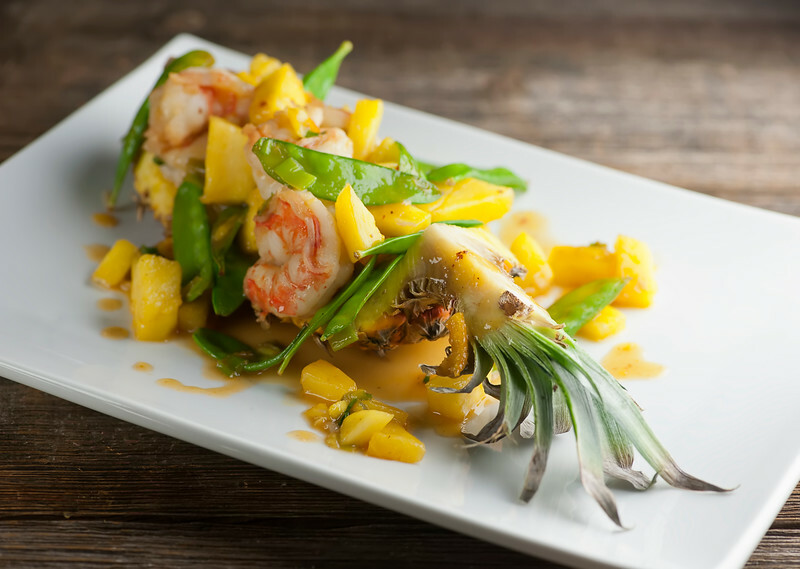 An ordinary pineapple transforms this recipe for sweet and sour shrimp to a tropical treat! Combine marmalade, vinegar, soy sauce and ginger and set aside. Melt butter in a large deep skillet over medium high heat. Saute shrimp and scallions for 3-4 minutes until shrimp are just opaque. Add pineapple chunks and snow peas and stir for another minute. Add sauce and stir for another minute until everything is coated and sauce is bubbly. Divide shrimp mixture among pineapple shell quarters and serve! Absolutely wonderful! This definitely transports me to some much sunnier tropical place. I’m especially excited that you’ve used marmalade! Now that’s something I don’t see in recipes very often … but why? I bet it makes such a beautifully sweet and sticky sauce! These flavors sound delicious together and easy. I will give this a try, thanks! This comment is full of so many fabulous suggestions – you are the best! The jelly packet ideas is naughty genius. YUM! I am so in love with fresh pineapple. And I am always looking for new yummy recipes for shrimp. So this recipe is a win-win! Plus, I love how you serve it in the actual pineapple. Gorgeous! Thanks Erin! I seem to forget about pineapple for long periods of time…and then I remember that oh yes, I LOVE PINEAPPLE! :) I also love that meatball recipe you posted recently – there must be a way to combine pineapples and your gorgeous meatballs…hmm.